Chocotoberfest is winding down but I wanted to get in one last chocolate recipe! 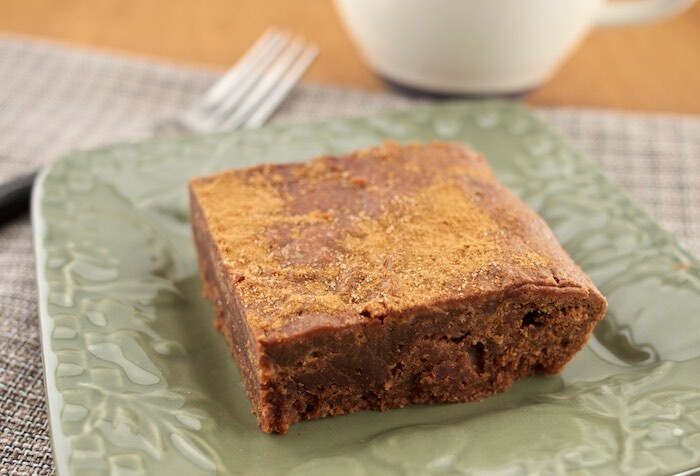 These Fudgy Chocolate Espresso Bars are thick rich and utterly delicious! Honestly you can't go wrong with a dessert that has chocolate and coffee infused in the base. Try them for yourself. Preheat oven to 350F. Butter and flour an 8-inch square cake pan. In a large bowl, whisk together flour, sugar, baking powder, cinnamon and salt. In a medium bowl, whisk together milk, eggs, vanilla, espresso, melted chocolate and butter. Pour liquid mixture into the flour mixture and stir until just combined. Pour half of the batter into the prepare pan, spreading it evenly over the bottom. It will be thick. Sprinkle with half the cinnamon sugar. Top with the remaining batter and cinnamon sugar. Bake for 30-40 minutes at 350F, just until a toothpick comes out clean. Let the cake cool in the pan for 15 minutes, then turn out onto a wire rack to cool completely. Love chocolate and espresso together! Just made my chocolate espresso cake today! Espresso with chocolate is a match made in heaven. Love the texture of this cake. Oh that espresso puts these bars just over the top!